These stage drapes are the front curtains the audience sees when they first enter the theatre. The Grand Drape starts and ends the show. It blocks the stage from sight, creates a point of interest in the room, and evokes anticipation of the performance to come. Its design, color, and movement will, quite literally, set the stage for all of your events. The traditional draw is a bi-parting curtain that opens from the middle and tracks off the stage in equal halves. Fullness is developed through a series of box pleats along the top hem that create tall vertical waves. Draw curtains are typically straight but it is easy to make them follow a curve as well. It is the most common and least costly of all the styles and can be hand or motor operated for the stage. Tracks for draw curtains can also be fitted with “backpack guides”. Backpack guides only engage when the curtain is pulled in the open direction. They cause the curtain panels to move as a fixed unit so the curtain collects at the off stage side rather than at the master carrier. If you find this hard to picture, find drapes or a shower curtain you can reach. Place your finger at one end and push the curtain open. As you push, the curtain collects at your finger making a bigger and bigger pile until the entire curtain is collected (and fully open). Do it again, but this time pull the first carrier tight to the wall, then grab the next carrier and pull it to the wall, then the next, and so forth one carrier at a time. This is what backpack guides do. Notice that when the curtain is half way open your stack back is beside the wall (off stage, out of sight) not in a big pile at the leading edge. Backpack guides are inexpensive and make the opening movement look much nicer and more professional. So why doesn’t everyone use them? The answer is that they can sometimes be frustrating in a facility where the operators are not trained. In order for them to work properly and not jamb, the rope must be clean and in good shape without significant wear or flaws. Spike tape placed on the rope (which is common) will foul the backpack guides instantly and can be difficult to get unstuck. If you need help deciding whether backpack guides are a good choice for your draw curtain, give us a call or talk to your local BellaTEX dealer when they come to measure. This is an ornate curtain with fullness developed through a series of horizontal festoons. It travels vertically, rising and falling by a series of cables that lift from the bottom, collapsing the festoons onto each other. Most Austrian-style curtains rise and fall evenly, but it is possible to make each of the cables work independently to create different openings and different shapes. Austrian curtains can be curved or straight. Since the entire weight of the drapes is lifted, Austrians must be motor operated. Due to their complexity and specialized rigging requirements, Austrians can easily be several times the cost of a Traditional Draw. The Waterfall is a combination of the Traditional Draw and Austrian styles. When fully closed the waterfall looks like a Traditional Draw with its tall majestic pleats, but when it opens it is lifted from the bottom in an Austrian fashion. As it rises the fabric is folded into flowing festoons that resemble that of an Austrian. A pipe batten is required at the bottom to make the curtain fold properly so it must raise/lower evenly. Waterfall curtains must be motor operated and are more expensive than a Traditional Draw, but are usually not as expensive as an Austrian. Guillotine curtains can be made in a variety of styles but most resemble the Traditional Draw when closed. Unlike the Waterfall which opens from the bottom up, the Guillotine rises as a single unit when the top batten/track is raised. 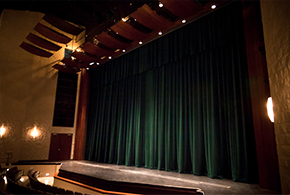 In order for the drapes to clear the audience’s view of the stage, there must be at least as much room above the curtain as the curtain is tall. Many Guillotines are a combination of Guillotine & Traditional Draw. This is achieved by simply rigging a Traditional Draw curtain and Track to a moveable batten. The floor pulley for draw operation is attached to a sandbag that can be flown rather than bolting it to the floor as usual. Guillotine curtains can be manually operated with a fly system or motorized. Cost can vary widely by circumstance. If a fly system exists, it is nothing more than a Traditional Draw hung from a line set; if no fly system exists one must be installed, which can add significantly to the cost. Tableau curtains, while an icon of classic stage curtains, are actually relatively rare in multi-use spaces today. They do not fully clear the stage when opened, and leave it framed in an ornate frilly tent shape of flowing fabric. This look is not conducive to many stage presentations, making it mostly a specialty item for dedicated shows where its nostalgic beauty and form lends itself to the specific presentation.